…is an ancient black. Forbidden rice not only has all the nutritional goodness you find in brown rice such as a high fiber content and B vitamins, it’s also packed full of anthocyanins. Bite per bite the rice contains more of these antioxidant flavonoid pigments than blueberries. It’s satisfyingly chewy in texture like my beloved short-grained brown rice and tastes wonderful. 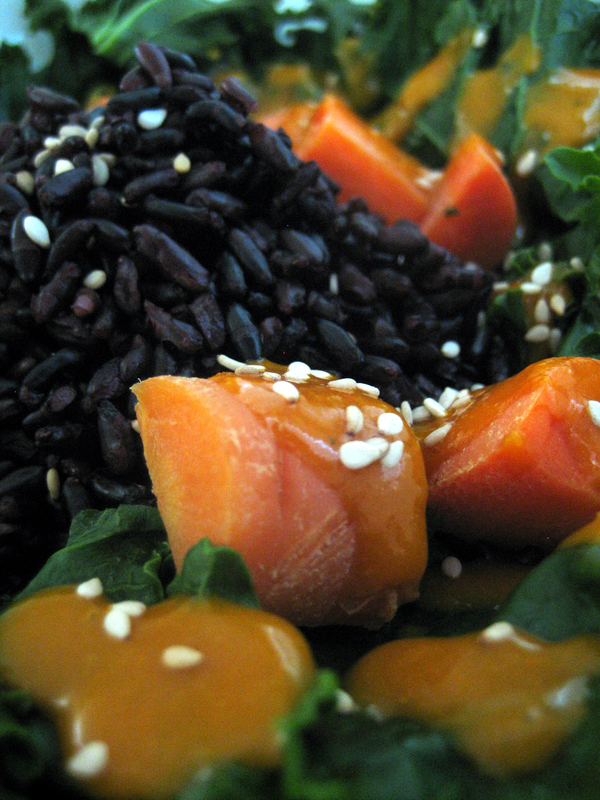 We have rice or grain bowls for meals on a regular basis and usually steam some kale and another vegetable [carrots in this example] and then add a wonderfully flavorful sauce to the mix. Bowls also make fantastically easy and filling lunchbox meals. Here is a quick and tasty gingered carrot sauce that’ll flavor up any bowl or steamed vegetable. Reduce the carrot juice by half over medium heat. Add the remaining ingredients and simmer over low heat for 5 minutes. Add the cornstarch slurry a tablespoon at a time, allowing the sauce to come to a simmer in between additions until you achieve the consistency you desire [1 T of the slurry was perfect for me]. It looks beautiful. Ginger and carrot is a great flavor combination too.